Some folks shy away from eating fruit that's fallen to the ground for food safety reasons. However, recently fallen fruit are sure-fired ripened fruit. Frankly, in my youth, I frequently picked-up and ate fruit off the ground. But, that was before the germ theory of disease reached into the hollows of my native state. Keep in mind that a lot of other animals also enjoy eating pawpaws and they may leave behind the end results. The pawpaw tasting included a short introduction to the various ways to eat a pawpaw starting with washing and peeling the fruit. Some eat the peel and all, but I find the peel interferes with enjoying the custard-like flesh. It's also a good idea to show the newly initiated the large potentially tooth-chipping seeds by slicing into the fruit. Once the fruit was "prepared," I demonstrated my well-honed watermelon-seed extraction technique by jamming half of a fruit into my mouth to expertly separate the seeds from the custardy goodness and then spit out the seeds. Thankfully, her looks of disgust though frequent are now fleeting. She used a more delicate approach by expertly wielding a paring knife to maximum effect; a skill that I always keep in mind during our infrequent disagreements. Of course, we inevitably began to compare the taste of pawpaw fruit to other fruity food including pineapple, banana, and mango. Finally, she asked why don't we just say the fruit tastes like pawpaw? She went on to observe that we don't typically describe apples as tasting like anything else; they taste like apples, not bananas, or mangoes. You see why I'm lucky there was one person in our union to contribute "smart genes" to our children. One challenge with pinning down the "true pawpaw flavor" is that there is considerable variability within the species, Asimina triloba. Research has shown that different varieties have different flavor profiles which shouldn't be surprising given the variability seen with other fruits. However, I believe this provides a partial explanation as to why we hear so many different descriptions for the taste of wild pawpaws. Sadly, I believe the pawpaw fruit season is rapidly drawing to a close; most definitely in southern Ohio, but perhaps elsewhere in the state. So, I urge you to get out this weekend, find a pawpaw patch, and enjoy these wonderful native fruits. Take friends and family along. Of course, be prepared to hush the inevitable fruit taste debate by simply saying: they taste like pawpaws. 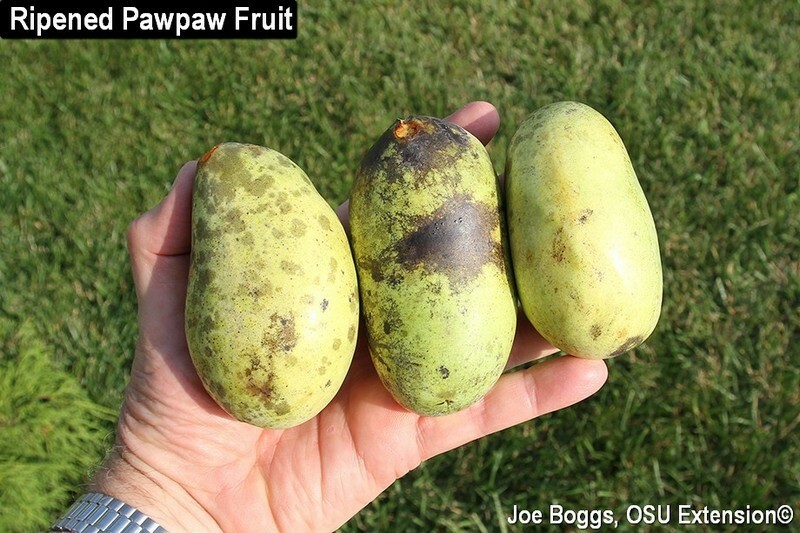 END NOTE: If you want to learn more about pawpaws, there is no better source than the Ohio Pawpaw Growers Association. You don't need to be "grower" to join; they welcome all pawpaw enthusiasts. They are a wonderful source of information including how to grow pawpaws in landscapes so you don't need to rely on a wild pawpaw patch to get your annual pawpaw fruit-fix. See "More Information" below for the link to their website.